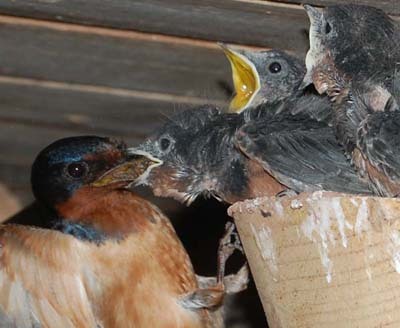 In a first attempt to record and identify prey brought to barn swallow nestlings, I mounted a Nikon digital camera from the ceiling near each of several nests and operated the camera remotely from a lap top on the second floor of the barn. Since the camera doesn't offer a preview, a small video camera was mounted beside it and the nest was viewed from a tv monitor beside the laptop. This technique proved not to be suitable for this purpose because of the approximately 2 second delay in remotely tripping the Nikon shutter. Of many hundreds of images taken as an adult brought prey to the nest, only several showed the insects. Dragging out one of my old motorized Nikon film cameras would have solved that problem, but the cost of that much film and processing and the time to scan the film was beyond the scope of this year's project. A higher resolution video camera and additional lighting might be a better approach. Then the camera wouldn't need to be monitored at all. The digital video recording could be reviewed later and individual frames grabbed that show the prey. If you try this, I would greatly appreciate hearing what you find. 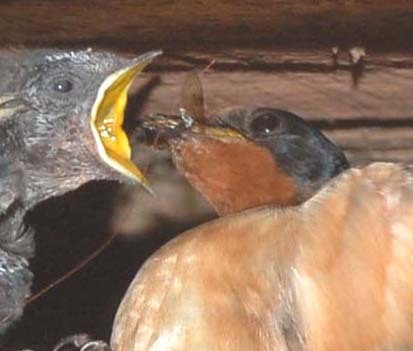 The most frequently observed prey items at several nests were flies. There has been no livestock on our 17 acres since 1984, so we don't have the fly population that a farmstead would have. 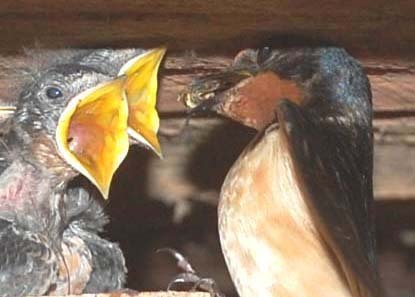 However, many people have commented to me that swallows nesting in their horse barns do a great job of keeping down the fly population. 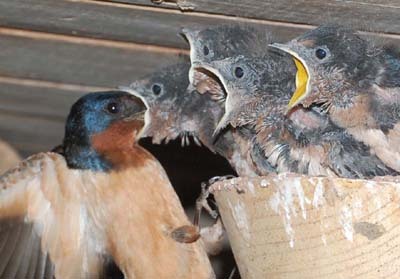 In previous years, during cold wet weather, I have seen the swallows gleaning flies off a window screen. Other insects brought to this year's nests were many moths, beetles, and even a few honey bees. A surprising number of very small insects were brought, often many at a time in one mouthful. While I couldn't identify mosquitoes in the photos, the fact that the swallows seem to be in a feeding frenzy both at dusk and dawn suggests that they are an effective mosquito control. 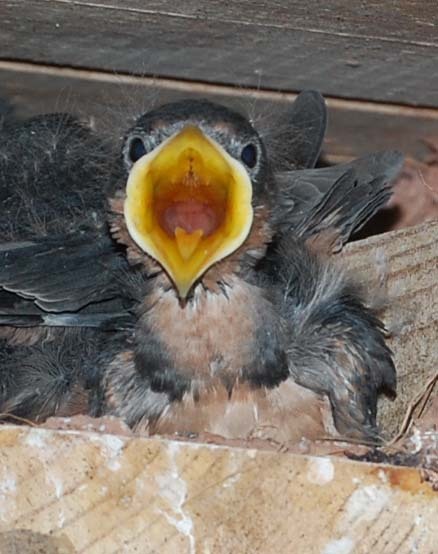 In mid August, I observed a dozen or so swallows, mostly fledglings, flying in tight circles over the metal roof of the wagon shed. This went on for several minutes, and, surprisingly, a large dragonfly had joined them. Both were flying in counter-clockwise (from my vantage point on the ground) approximately 15-20 ft circles, apparently gleaning a huge number of very small insects. Several minutes later, when I returned, the swallows were gone, but now there were 6 large dragonflies, all flying in the same circular pattern. Whatever gnat size insects were present were still completely invisible to me. Seeing the dragonfly and swallows hunting side by side reminded me that the purple martin gourd rack is only 50 feet away. 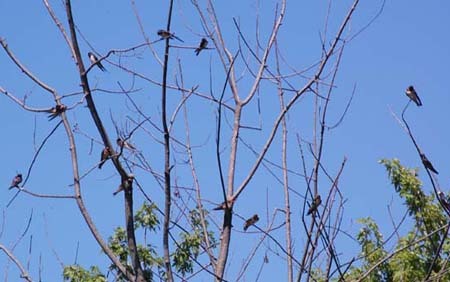 Luckily for the dragonfly, the martins had already departed from the gourds. 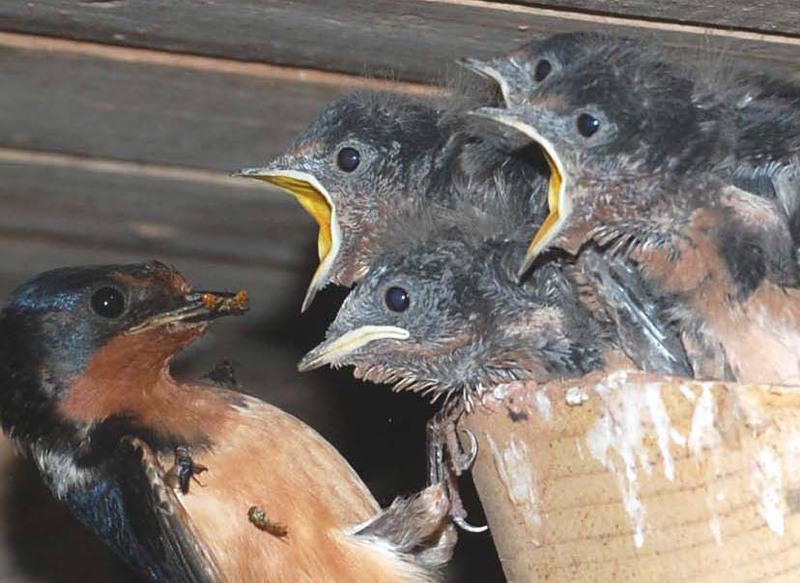 I remember, some years ago, watching a purple martin trying to stuff a large dragonfly down the throat of a nestling not much larger than the dragonfly. Despite the old myth that purple martins are major mosquito predators, one of their favorite prey items seems to be the dragonfly. And, the dragonfly, in both its larval and adult stage, really is a major mosquito predator. But, the martins do provide a valuable service in helping control a variety of larger insects. And, even if they didn't, I would still want them nesting in our yard. Many smaller insects are lost when delivered by the mouthful. 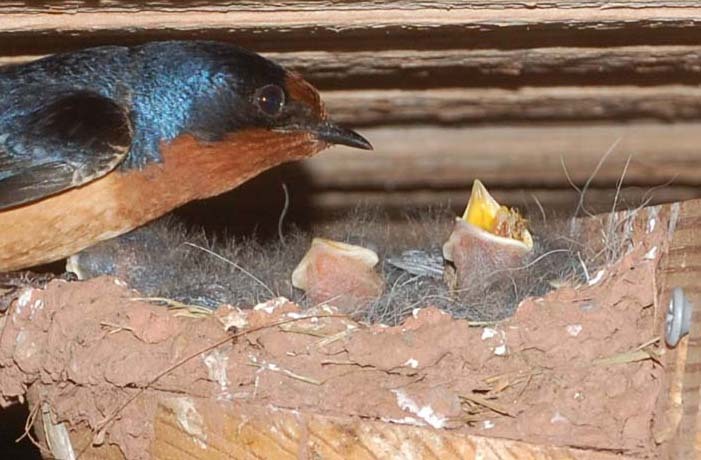 Note in the middle left photo above, a nestling's mouth is pinned to the rim of the nest with the parent's foot. Luckily, swallows are much more graceful in the air. 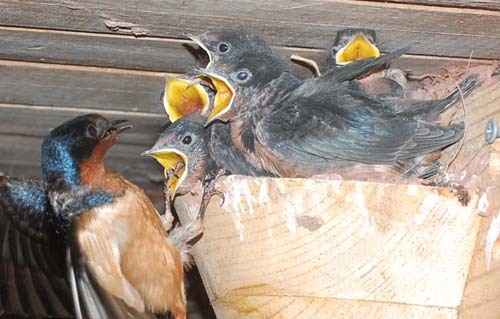 In the above left photo, an adult has led a flock of fledglings to the ugly young maple, where they wait to be fed, while enjoying life outside the swallow room. &COPY; 2013 American Artifacts and Richard Van Vleck, Taneytown, Maryland.